BEIJING, China (CNN) -- A magnitude-7.9 earthquake that struck southwestern China last year left 5,335 students dead or missing and disabled an additional 546 children, state media reported. 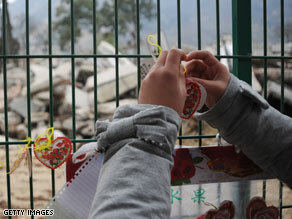 A girl fastens wish cards at a middle school at Qushan township earlier this year in memory of students. The first official tally of students killed in the Sichuan province quake was released Thursday by Tu Wentao, the head of the province's education department, the Xinhua news agency said. As of September, official figures put the death toll at 69,227, with more than 17,923 people missing. The tremor struck May 12 about 2:30 p.m., when many children were in school. The official tally of student deaths and injuries was released a few days after an Amnesty International report accused the government of China of intimidating and unlawfully detaining relatives of children who had died in the earthquake. The 52-page report, published Sunday, documented instances in which relatives said they had been detained for up to 21 days for trying to get answers from officials. "By unlawfully locking up parents of children who died, the government is creating more misery for people who have said in some cases they lost everything in the Sichuan earthquake," said Roseann Rife, deputy program director of Amnesty International Asia-Pacific. The report also accused authorities of preventing relatives from complaining to higher officials about the quality of construction in the buildings that had collapsed. The human-rights organization called on Chinese authorities "to take immediate action to address the grievances of survivors and relatives of those who were killed or injured." CNN was not immediately able to get a response to the report from China's Ministry of Civil Affairs and Ministry of Justice.